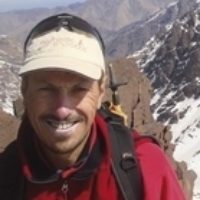 Des Clark is a qualified International Mountain Leader who has his permanent home in southern Morocco, close to the High Atlas mountains. Here he runs his own mountaineering and trekking business, guiding trips in winter, spring and autumn throughout the Atlas range. He has climbed extensively in Ireland, Scotland, Iceland, the Alps, Pyrenees and Andes, but reserves a special fondness for his High Atlas home.